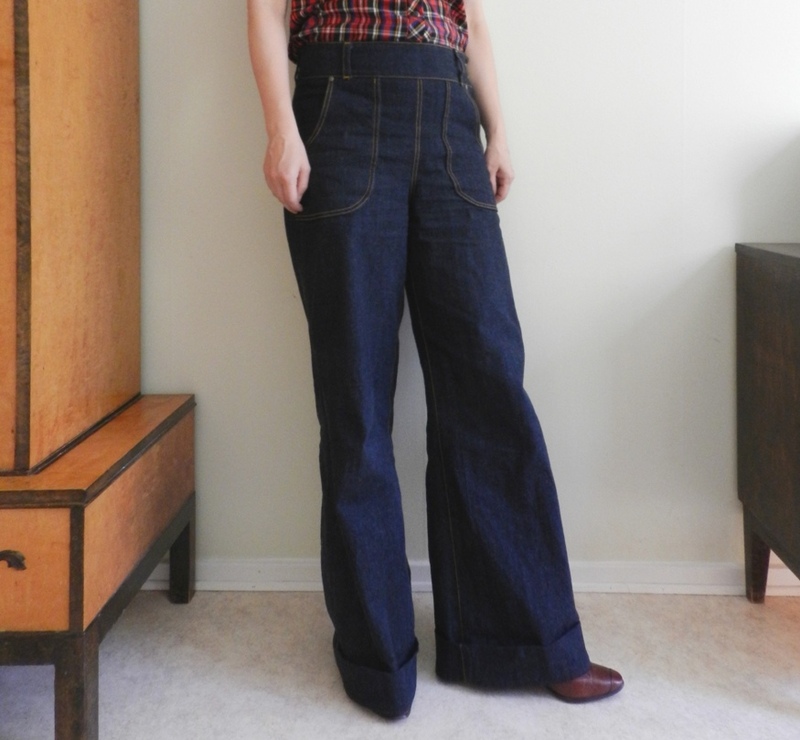 Quite soon after I made the velvet sailor pants, I decided that I wanted to reuse this pattern, #113 from Burdastyle 10/2016, to make jeans. 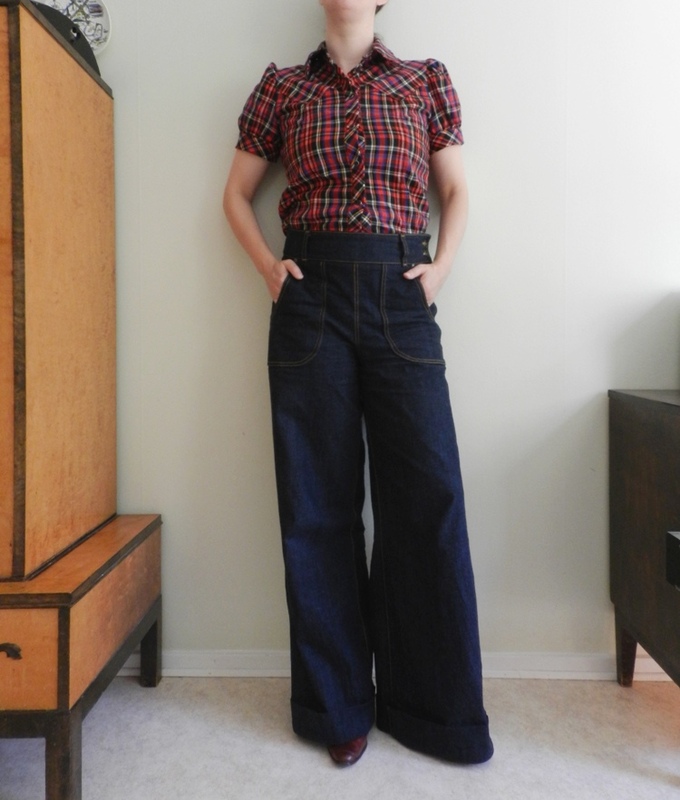 The big curved front pockets reminded me some vintage/retro/reproduction jeans that I’ve seen around and I figured that they would go well with many of my selfmade blouses. 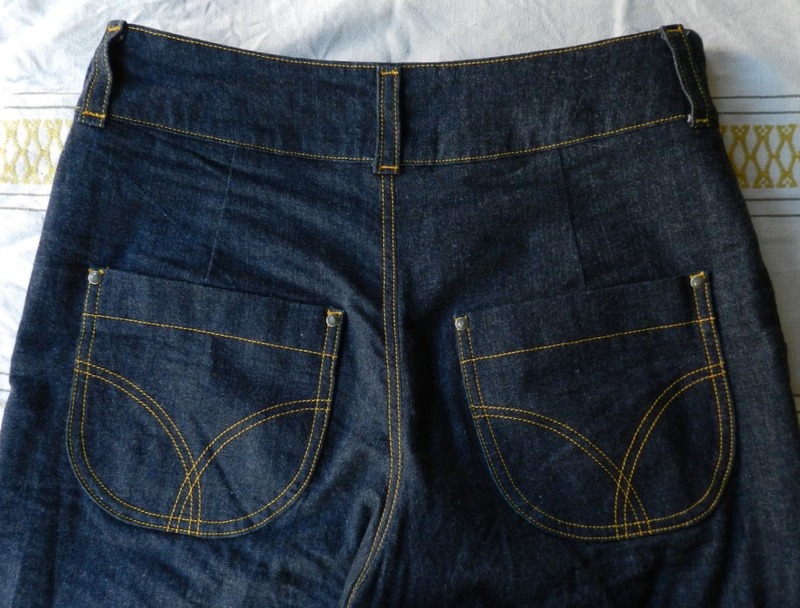 This mid-weight jeans fabric with some stretch was purchased earlier this year at the clearance section of Ohlssons Tyger here in Malmö. I still try to stick to second hand fabrics and notions as much as possible, but in my experience nice-looking denim is hard to find at the thrift store, so sometimes I will have to make an exception. 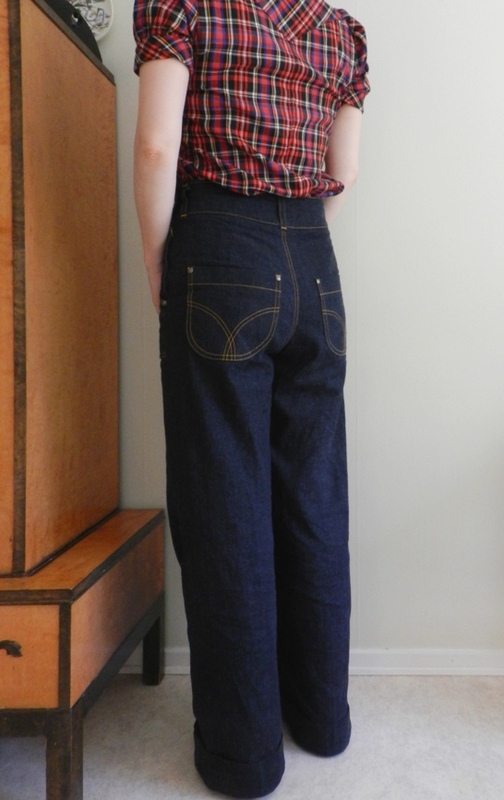 I am a bit unsure about the quality of this particular fabric, though, as it seems a bit flimsy in comparison to the heavy denim I used for last year’s sailor jeans. Also, the stretch content makes the pants a bit saggy and wrinkly after wearing, although it also means that they are super comfortable. Speaking of comfort, the only fitting adjustment I made in comparison to the velvet pair was lowering the crotch a little. 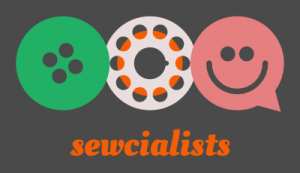 Turning these pants into jeans required a number of alterations and additions. 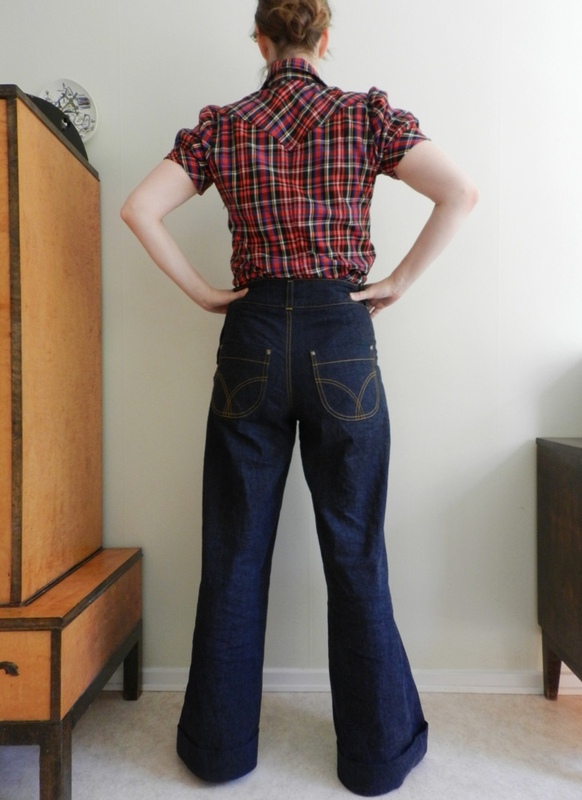 While it was not my aim to copy an authentic vintage pair of jeans from a specific decade – in that case it would probably have been better to use an original pattern as a starting point – I looked at jeans from the 30s, 40s and 50s for inspiration. 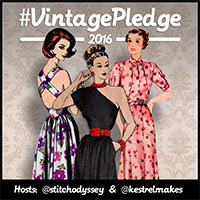 I exchanged the invisible zipper for a lapped zipper with shield and extended the waistband to create an overlap for two buttons. While the side zipper certainly leaves room for improvement, I am quite proud of myself for figuring out how to construct it more or less by myself and I feel like I learned a lot from this process. I considered doing an all-button closure, because I love how they look, but I have a whole bunch of these jeans zippers, so it made sense to use one of those. The pattern does not come with back pockets, so I had to draw these myself. 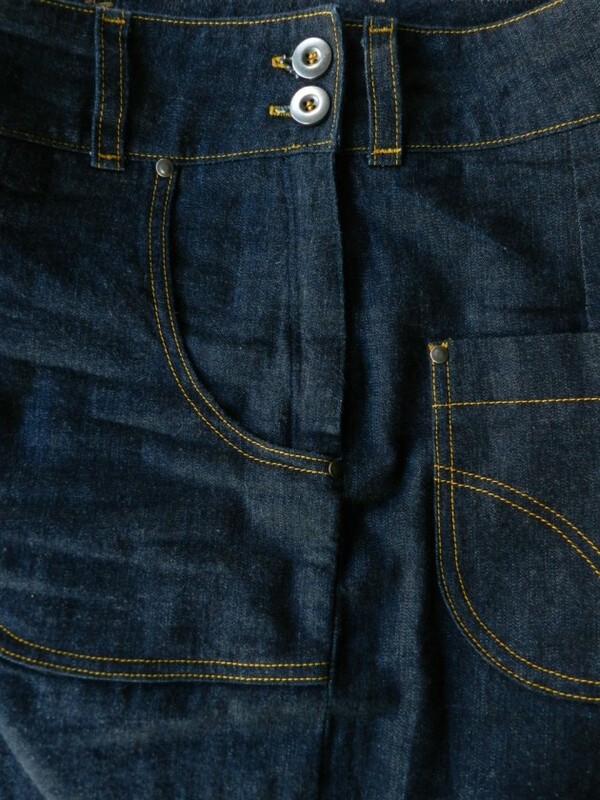 I wanted rounded pockets to match the front pockets. Both the pocket shape and top stitching are based on vintage jeans I saw on the internet, but unfortunately, I forgot where and even what decade they were from. I used one of my shop-bought jeans to determine the placement of the pockets. Perhaps they ended up a bit too low, but I do like how their placement matches that of the front pockets, even though that was not a conscious decision! 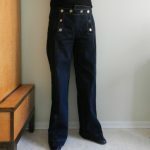 Unfortunately, I only realized after cutting out the back legs that I could have converted the back darts into a yoke to make the pants even more jeans-like. Perhaps next time! I did make sure to add belt loops and rivets on the pockets. I bought the rivets years ago, but was always apprehensive about using them. As it turns out, inserting them was not difficult at all and I really do hope that they will make the pants more durable, as I invested so much time in them! The pictures were taken after wearing the pants, hence the wrinkles. Ironing jeans is against my principles anyway. 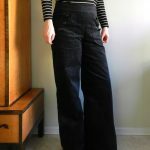 I do not have the habit to keep track of how much time I spend on my garments, but I am quite sure that making these jeans took at least twice and perhaps even thrice as long as the velveteen pants. While I enjoy top stitching, it seems I have to have the right frame of mind to do it, as it can be quite straining on the eyes (especially when my eyes are already twitching from working on the computer for most of the week). The legs (with turn ups!) are still a bit long, so I have to wear the pants with heels. I expect them to shrink somewhat over time. As is often the case with me, the project stalled when most of the work was done. I had to redo certain areas and then ran out of top stitching thread when I was halfway through the waistband. This was right before my summer hiatus and while these jeans would also have been a welcome addition to my summer wardrobe, for some reason I could not bring myself to finish them until two weeks ago. Perhaps that was for the best, as I love wearing them and had I finished them in spring I may already have worn them out by now. 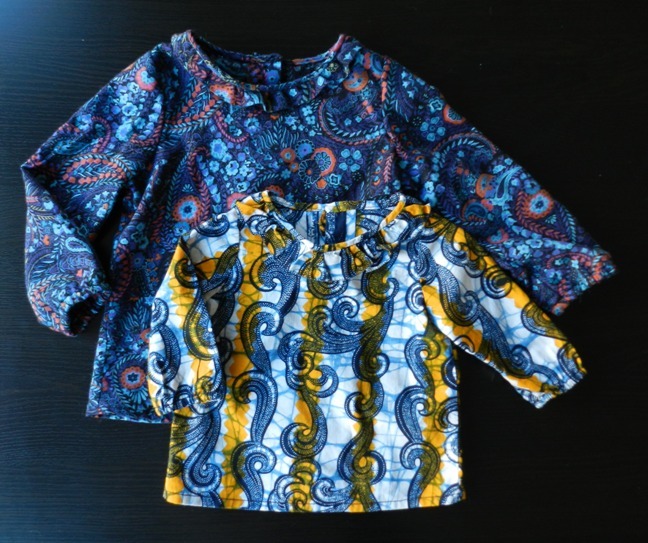 Worn with the knotted shirt, also from Burdastyle 10/2016. Gütermann topstitching thread c. SEK 22 (about half a big spool). I estimate that these jeans cost me about SEK 150 (c. EUR 16) in materials.